On June 12th, 2007, Ms. Led return with their highly-anticipated new album, Shake Youself Awake. With an impassioned political message, the album is an energetic and unapologetic call to action mixed with songs of personal struggle and triumph. Recorded at legendary London Bridge Studio and mixed and mastered by Grammy-award winning producer, Kramer (Urge OverKill, Low, Galaxie 500), Shake Yourself Awake is Ms. Led's follow-up to 2004's politically charged and critically acclaimed album These Things We Say. Written over a span of 2 years, Shake Yourself Awake is singer/songwriter/guitarist Lesli Wood's strongest and most eclectic songwriting to date - varying from the punk rock energy on tracks like "New Agenda", to the 60's girl group stylings of "Up to the Old Tricks". Wood's lyrics are a fearless examination of social issues, personal vulnerability, and empowerment, backed with unmatched urgency from bassist, Matt Menovcik, guitarist Peg Wood, and drummer, Steph Hasselman. For Wood, the album is her most personal work, inspired by her own challenges and her battle with Multiple Sclerosis, while maintaining an active career in music and completing law school. "I have dealt with being told what I can and can't do on so many levels. Having MS, I was told that I wouldn't be able to continue playing music," says Wood. "I was told to slow down, rest more, maybe giving up parts of my life. We always put so many restrictions on ourselves. We make excuses bout stability, money relationships, careers... Who says you can't do what you want?" Ms. Led's refusal to compromise - politically or personally - is evident in the band's passion and conviction throughout Shake Yourself Awake. In the call to action of "New Agenda" Wood sings, "We've got to educate, communicate, organize, criticize, demand to know why, unify, rectify." And the self-assured lyrics of "Have it All" remind us, "Everyday is opportunity to make waves and everyday is your chance to try and make change." Ms. Led's first two albums quickly sold out of their first pressings. All the while, the band has maintained their DIY ethic and built a dedicated following. Often referred to as a "must-see live show," Ms. Led have become recognized not only for their political edge but also for their catchy, even danceable, songs and their infectious energy and raw emotion. 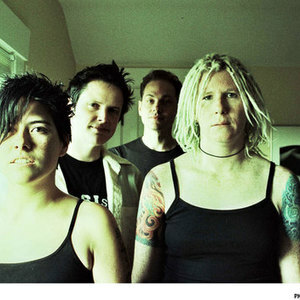 The group has toured with such acts as The Gossip, 50 Foot Wave, The Avengers, The Thermals and The Reputation and has played at such prestigious festivals as the Bumbershoot Festival, Ladyfest, and the Capitol Hill Block Party. In support of Shake Yourself Awake, Ms. Led will bring their high energy live show to the masses with a national tour in summer 2007. 2004's These Things We Say garnered rave reviews nationwide and was described by Punk Planet as "sharp-as-a-tack power pop that barely takes time to breathe." Produced by Martin Feveyear(Mudhoney, Queens of the Stone Age), the album was voted one of the top Overall Albums of 2004 by KEXP listeners, reached #8 in the Top Northwest Albums of 2004, and was included on the Best of 2004 charts for the Seattle Weekly, Three Imaginary Girls, and John in the Morning.